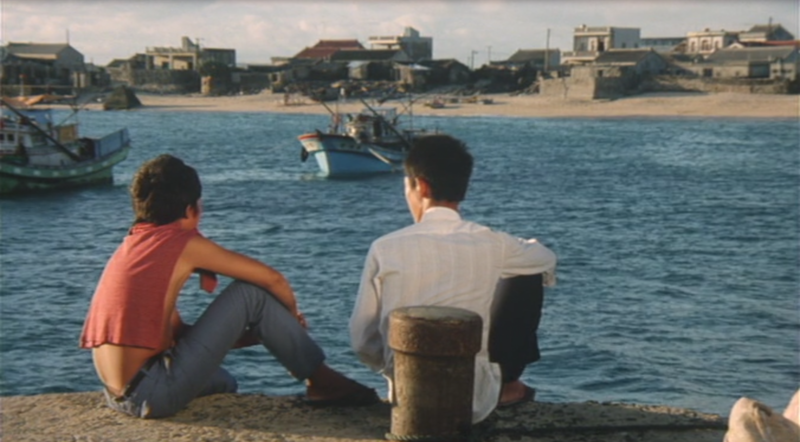 Hou Hsiao-hsien’s 1983 film The Boys from Fengkuei is on the surface a classic, cut-and-dry bildungsroman, a narrative of young men from a rural area infected by the restlessness of adolescence before moving to the “big city” (in this case, the port of Kaohsiung) to face eventual disillusionment and the loss of their previous naiveté. It’s difficult to imagine a basic narrative dearer or more well-known than that of the transition from childhood into adulthood. With that familiarity in mind, it’s essential to ask how this particular chronicle differs from the hive of such films and fictions within its genre. As seminal as the “coming of age” narrative is to storytelling, it’s also something of a sandpit of innovation for the storyteller, flattening most presentations into a series of consecutive tropes. The Boys from Fengkuei is certainly not without its share of tropes: The Boy Who Stays Behind. The Divisive Love Interest. The Cruel Merchant Indicative of a Crueler City. All such character types appear in the film like dominos falling in perfect time within the plot’s slow crawl towards inevitable Maturity. But as with many films working within the confines of the bildungsroman genre, the pull of the narrative is less about innovation and more about presentation. Such stories may confine themselves to the same general arc—boys grow up and become, in one way or another, men—but in the right hands such arcs can be invested with genuine feeling and ingenuity. In this theatre (no pun intended; I watched it on a laptop), Hou triumphs. Among the film’s most striking features are its inordinately long shots, the average coming out to around one minute and eighteen seconds. The lengthiest among these focus primarily on individuals—characters in between actions, just sitting, thinking, staring off into the distance, wholly preoccupied with that primary adolescent pastime of brooding. Hou’s willingness to force the viewer into these spaces demonstrates his disposition towards confronting the less glamorous aspects of the adolescent narrative. Namely, the concrete truth (and the primary exploration of the recent bildungsroman, Richard Linklater’s Boyhood) that growing up mirrors the same progression used by Hemingway in The Sun Also Rises to describe bankruptcy: “Gradually, then suddenly.” The tale of adolescence: Something is happening, though it feels like nothing at all. Hou skillfully embraces this principle regarding the his characters’ gradual—oh so gradual—maturation in his filmmaking, allowing his artfully contrived long static shots to express and thereby deepen the classically structured narrative, descending into a realm of realism that, for all its patience, bridges on uncomfortable. The Boys from Fengkuei speaks to where we’ve been, and for those of us still ensnared in the doldrums pangs of “growing up,” it tells us where we’re going. Written by: Wells Hamilton on October 13, 2015.